took part in the Orthodox Christmas procession outside the Church of the Nativity in Bethlehem. The Bethlehem City municipality has canceled all celebrations for Christmas this year, and only kept the religious events on the schedule. As the Israeli war on Gaza entered its 11th day, at least 577 Palestinians, including women and children, have been killed, and more than 2,700 wounded. Early this morning, the Patriarch of the Assyrian Orthodox Church was the first religious figure to arrive in Bethlehem, followed by the Patriarch of the Coptic Church. 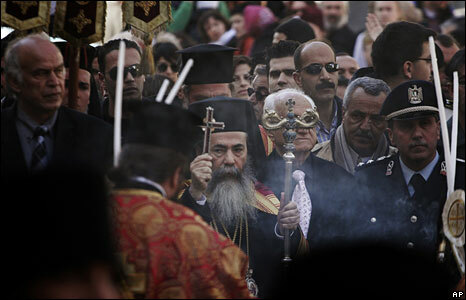 At midday, the Patriarch of the Greek Orthodox Church, Theofilos III, arrived at the Manger Square in Bethlehem city centre, where he was greeted by Bethlehem Governor Salah Al-Ta'mari, Mayor of Bethlehem, Dr. Victor Batarseh, and the Palestinian Minister of Tourism, Khouloud Daibes, in addition to members of the Palestinian Legislative Council (PLC) from the Bethlehem. Father Attalah Hannah, a Palestinian Greek Othrdox official, told IMEMC after the midday mass that all the world has to do its best to stop the killing of Palestinians in Gaza. "From this holy place on this speacial day, I send a massege of peace, I call upon all the nations of the world to stop the attack on our nation living in Gaza, the attacks on Gaza are a crime." Christmas is celebrated by Orthodox Christians throughout the world on January 7th.